NOTE: These regulations are posted only as a handy guide. They are subject to change from time-to-time without prior notice. This site does not autmatically provide updates to the regulations! Class handouts are however current and up-to-date. Check with OSHA for any changes. 1910.178(a) General requirements.1910.178(a)(1)This section contains safety requirements relating to fire protection, design, maintenance, and use of fork trucks, tractors, platform lift trucks, motorized hand trucks, and other specialized industrial trucks powered by electric motors or internal combustion engines. This section does not apply to compressed air or nonflammable compressed gas-operated industrial trucks, nor to farm vehicles, nor to vehicles intended primarily for earth moving or over-the-road hauling. 1910.178(a)(2) All new powered industrial trucks acquired and used by an employer shall meet the design and construction requirements for powered industrial trucks established in the "American National Standard for Powered Industrial Trucks, Part II, ANSI B56.1-1969", which is incorporated by reference as specified in § 1910.6, except for vehicles intended primarily for earth moving or over-the-road hauling. 1910.178(a)(3) Approved trucks shall bear a label or some other identifying mark indicating approval by the testing laboratory. 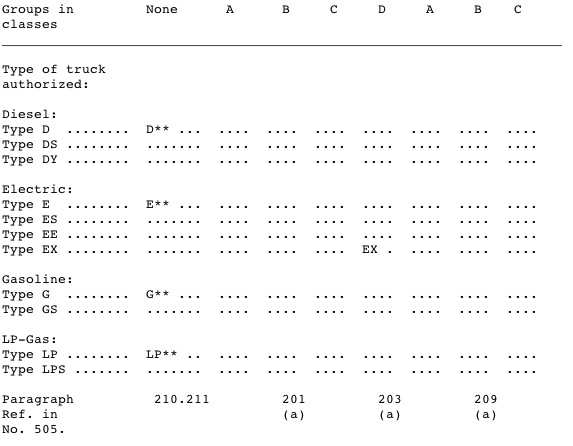 See paragraph (a)(7) of this section and paragraph 405 of "American National Standard for Powered Industrial Trucks, Part II, ANSI B56.1-1969", which is incorporated by reference in paragraph (a)(2) of this section and which provides that if the powered industrial truck is accepted by a nationally recognized testing laboratory it should be so marked. 1910.178(a)(4) Modifications and additions which affect capacity and safe operation shall not be performed by the customer or user without manufacturers prior written approval. Capacity, operation, and maintenance instruction plates, tags, or decals shall be changed accordingly. 1910.178(a)(5) If the truck is equipped with front-end attachments other than factory installed attachments, the user shall request that the truck be marked to identify the attachments and show the approximate weight of the truck and attachment combination at maximum elevation with load laterally centered. 1910.178(a)(6) The user shall see that all nameplates and markings are in place and are maintained in a legible condition. 1910.178(a)(7) As used in this section, the term, "approved truck" or "approved industrial truck" means a truck that is listed or approved for fire safety purposes for the intended use by a nationally recognized testing laboratory, using nationally recognized testing standards. Refer to 1910.155(c)(3)(iv)(A) for definition of nationally recognized testing laboratory. 1910.178(b) Designations. For the purpose of this standard there are eleven different designations of industrial trucks or tractors as follows: D, DS, DY, E, ES, EE, EX, G, GS, LP, and LPS. 1910.178(b)(1) The D designated units are units similar to the G units except that they are diesel engine powered instead of gasoline engine powered. 1910.178(b)(2) The DS designated units are diesel powered units that are provided with additional safeguards to the exhaust, fuel and electrical systems. They may be used in some locations where a D unit may not be considered suitable. 1910.178(b)(3) The DY designated units are diesel powered units that have all the safeguards of the DS units and in addition do not have any electrical equipment including the ignition and are equipped with temperature limitation features. 1910.178(b)(4) The E designated units are electrically powered units that have minimum acceptable safeguards against inherent fire hazards. 1910.178(b)(5) The ES designated units are electrically powered units that, in addition to all of the requirements for the E units, are provided with additional safeguards to the electrical system to prevent emission of hazardous sparks and to limit surface temperatures. They may be used in some locations where the use of an E unit may not be considered suitable. 1910.178(b)(6) The EE designated units are electrically powered units that have, in addition to all of the requirements for the E and ES units, the electric motors and all other electrical equipment completely enclosed. In certain locations the EE unit may be used where the use of an E and ES unit may not be considered suitable. 1910.178(b)(7) The EX designated units are electrically powered units that differ from the E, ES, or EE units in that the electrical fittings and equipment are so designed, constructed and assembled that the units may be used in certain atmospheres containing flammable vapors or dusts. 1910.178(b)(8) The G designated units are gasoline powered units having minimum acceptable safeguards against inherent fire hazards. 1910.178(b)(9) The GS designated units are gasoline powered units that are provided with additional safeguards to the exhaust, fuel, and electrical systems. They may be used in some locations where the use of a G unit may not be considered suitable. 1910.178(b)(10) The LP designated unit is similar to the G unit except that liquefied petroleum gas is used for fuel instead of gasoline. 1910.178(b)(11) The LPS designated units are liquefied petroleum gas powered units that are provided with additional safeguards to the exhaust, fuel, and electrical systems. They may be used in some locations where the use of an LP unit may not be considered suitable. 1910.178(b)(12) The atmosphere or location shall have been classified as to whether it is hazardous or nonhazardous prior to the consideration of industrial trucks being used therein and the type of industrial truck required shall be as provided in paragraph (d) of this section for such location. 1910.178(c)(1) The industrial trucks specified under subparagraph (2) of this paragraph are the minimum types required but industrial trucks having greater safeguards may be used if desired. 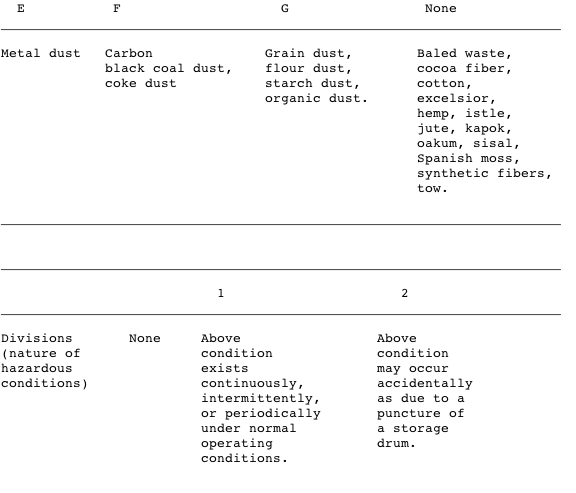 1910.178(c)(2) For specific areas of use see Table N-1 which tabulates the information contained in this section. References are to the corresponding classification as used in subpart S of this part. 1910.178(c)(2)(i) Power-operated industrial trucks shall not be used in atmospheres containing hazardous concentration of acetylene, butadiene, ethylene oxide, hydrogen (or gases or vapors equivalent in hazard to hydrogen, such as manufactured gas), propylene oxide, acetaldehyde, cyclopropane, diethyl ether, ethylene, isoprene, or unsymmetrical dimethyl hydrazine (UDMH). 1910.178(c)(2)(ii)-1910.178(c)(2)(ii)(a) Power-operated industrial trucks shall not be used in atmospheres containing hazardous concentrations of metal dust, including aluminum, magnesium, and their commercial alloys, other metals of similarly hazardous characteristics, or in atmospheres containing carbon black, coal or coke dust except approved power-operated industrial trucks designated as EX may be used in such atmospheres. 1910.178(c)(2)(ii)(b) In atmospheres where dust of magnesium, aluminum or aluminum bronze may be present, fuses, switches, motor controllers, and circuit breakers of trucks shall have enclosures specifically approved for such locations. 1910.178(c)(2)(iii) Only approved power-operated industrial trucks designated as EX may be used in atmospheres containing acetone, acrylonitrile, alcohol, ammonia, benzine, benzol, butane, ethylene dichloride, gasoline, hexane, lacquer solvent vapors, naphtha, natural gas, propane, propylene, styrene, vinyl acetate, vinyl chloride, or xylenes in quantities sufficient to produce explosive or ignitable mixtures and where such concentrations of these gases or vapors exist continuously, intermittently or periodically under normal operating conditions or may exist frequently because of repair, maintenance operations, leakage, breakdown or faulty operation of equipment. 1910.178(c)(2)(iv) Power-operated industrial trucks designated as DY, EE, or EX may be used in locations where volatile flammable liquids or flammable gases are handled, processed or used, but in which the hazardous liquids, vapors or gases will normally be confined within closed containers or closed systems from which they can escape only in case of accidental rupture or breakdown of such containers or systems, or in the case of abnormal operation of equipment; also in locations in which hazardous concentrations of gases or vapors are normally prevented by positive mechanical ventilation but which might become hazardous through failure or abnormal operation of the ventilating equipment; or in locations which are adjacent to Class I, Division 1 locations, and to which hazardous concentrations of gases or vapors might occasionally be communicated unless such communication is prevented by adequate positive-pressure ventilation from a source of clear air, and effective safeguards against ventilation failure are provided. 1910.178(c)(2)(v) In locations used for the storage of hazardous liquids in sealed containers or liquified or compressed gases in containers, approved power-operated industrial trucks designated as DS, ES, GS, or LPS may be used. 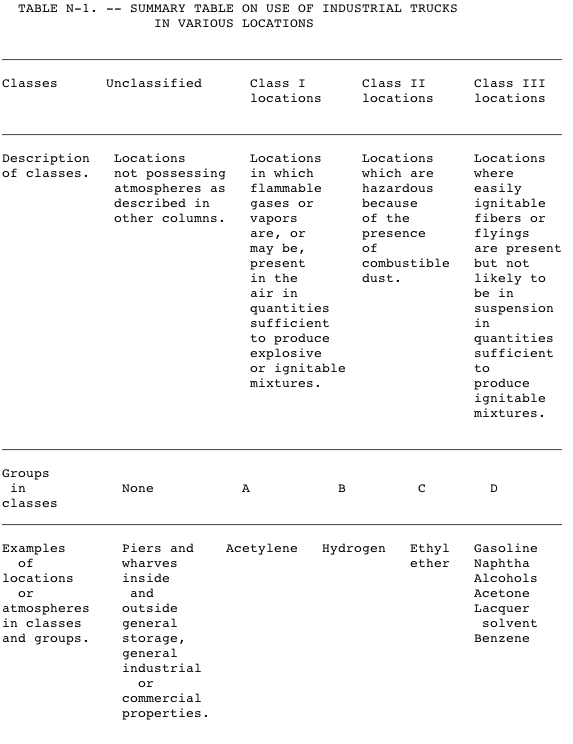 This classification includes locations where volatile flammable liquids or flammable gases or vapors are used, but which, would become hazardous only in case of an accident or of some unusual operating condition. 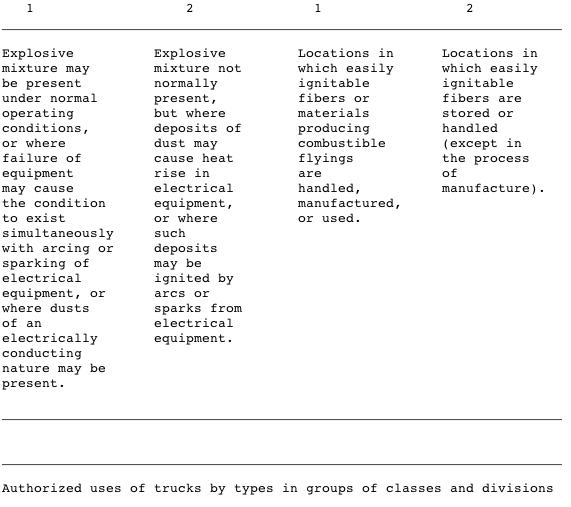 The quantity of hazardous material that might escape in case of accident, the adequacy of ventilating equipment, thetotal area involved, and the record of the industry or business with respect to explosions or fires are all factors that should receive consideration in determining whether or not the DS or DY, ES, EE, GS, LPS designated truck possesses sufficient safeguards for the location. Piping without valves, checks, meters and similar devices would not ordinarily be deemed to introduce a hazardous condition even though used for hazardous liquids or gases. Locations used for the storage of hazardous liquids or of liquified or compressed gases in sealed containers would not normally be considered hazardous unless subject to other hazardous conditions also. 1910.178(c)(2)(vi)-1910.178(c)(2)(vi)(a) Only approved power operated industrial trucks designated as EX shall be used in atmospheres in which combustible dust is or may be in suspension continuously, intermittently, or periodically under normal operating conditions, in quantities sufficient to produce explosive or ignitable mixtures, or where mechanical failure or abnormal operation of machinery or equipment might cause such mixtures to be produced. 1910.178(c)(2)(vi)(b) The EX classification usually includes the working areas of grain handling and storage plants, room containing grinders or pulverizers, cleaners, graders, scalpers, open conveyors or spouts, open bins or hoppers, mixers, or blenders, automatic or hopper scales, packing machinery, elevator heads and boots, stock distributors, dust and stock collectors (except all-metal collectors vented to the outside), and all similar dust producing machinery and equipment in grain processing plants, starch plants, sugar pulverizing plants, malting plants, hay grinding plants, and other occupancies of similar nature; coal pulverizing plants (except where the pulverizing equipment is essentially dust tight); all working areas where metal dusts and powders are produced, processed, handled, packed, or stored (except in tight containers); and other similar locations where combustible dust may, under normal operating conditions, be present in the air in quantities sufficient to produce explosive or ignitable mixtures. 1910.178(c)(2)(vii) Only approved power-operated industrial trucks designated as DY, EE, or EX shall be used in atmospheres in which combustible dust will not normally be in suspension in the air or will not be likely to be thrown into suspension by the normal operation of equipment or apparatus in quantities sufficient to produce explosive or ignitable mixtures but where deposits or accumulations of such dust may be ignited by arcs or sparks originating in the truck. 1910.178(c)(2)(viii) Only approved power-operated industrial trucks designated as DY, EE, or EX shall be used in locations which are hazardous because of the presence of easily ignitable fibers or flyings but in which such fibers or flyings are not likely to be in suspension in the air in quantities sufficient to produce ignitable mixtures. 1910.178(c)(2)(ix) Only approved power-operated industrial trucks designated as DS, DY, ES, EE, EX, GS, or LPS shall be used in locations where easily ignitable fibers are stored or handled, including outside storage, but are not being processed or manufactured. Industrial trucks designated as E, which have been previously used in these locations may be continued in use. 1910.178(c)(2)(x) On piers and wharves handling general cargo, any approved power-operated industrial truck designated as Type D, E, G, or LP may be used, or trucks which conform to the requirements for these types may be used. 1910.178(c)(2)(xi) If storage warehouses and outside storage locations are hazardous only the approved power-operated industrial truck specified for such locations in this paragraph (c) (2) shall be used. If not classified as hazardous, any approved power-operated industrial truck designated as Type D, E, G, or LP may be used, or trucks which conform to the requirements for these types may be used. 1910.178(c)(2)(xii) If general industrial or commercial properties are hazardous, only approved power-operated industrial trucks specified for such locations in this paragraph (c) (2) shall be used. If not classified as hazardous, any approved power-operated industrial truck designated as Type D, E, G, or LP may be used, or trucks which conform to the requirements of these types may be used. 1910.178(d) Converted industrial trucks. Power-operated industrial trucks that have been originally approved for the use of gasoline for fuel, when converted to the use of liquefied petroleum gas fuel in accordance with paragraph (q) of this section, may be used in those locations where G, GS or LP, and LPS designated trucks have been specified in the preceding paragraphs. 1910.178(e) Safety guards.1910.178(e)(1)High Lift Rider trucks shall be fitted with an overhead guard manufactured in accordance with paragraph (a) (2) of this section, unless operating conditions do not permit. 1910.178(e)(2) If the type of load presents a hazard, the user shall equip fork trucks with a vertical load backrest extension manufactured in accordance with paragraph (a) (2) of this section. 1910.178(f) Fuel handling and storage. 1910.178(f)(2) The storage and handling of liquefied petroleum gas fuel shall be in accordance with NFPA Storage and Handling of Liquefied Petroleum Gases (NFPA No. 58-1969), which is incorporated by reference as specified in Sec. 1910.6. 1910.178(g) Changing and charging storage batteries. 1910.178(g)(1) Battery charging installations shall be located in areas designated for that purpose. 1910.178(g)(2) Facilities shall be provided for flushing and neutralizing spilled electrolyte, for fire protection, for protecting charging apparatus from damage by trucks, and for adequate ventilation for dispersal of fumes from gassing batteries. 1910.178(g)(3)[Reserved]1910.178(g)(4) A conveyor, overhead hoist, or equivalent material handling equipment shall be provided for handling batteries. 1910.178(g)(5) Reinstalled batteries shall be properly positioned and secured in the truck. 1910.178(g)(6) A carboy tilter or siphon shall be provided for handling electrolyte. 1910.178(g)(7) When charging batteries, acid shall be poured into water; water shall not be poured into acid. 1910.178(g)(8) Trucks shall be properly positioned and brake applied before attempting to change or charge batteries. 1910.178(g)(9) Care shall be taken to assure that vent caps are functioning. The battery (or compartment) cover(s) shall be open to dissipate heat. 1910.178(g)(10) Smoking shall be prohibited in the charging area. 1910.178(g)(11) Precautions shall be taken to prevent open flames, sparks, or electric arcs in battery charging areas. 1910.178(g)(12) Tools and other metallic objects shall be kept away from the top of uncovered batteries. 1910.178(h) Lighting for operating areas. 1910.178(h)(1)[Reserved] 1910.178(h)(2) Where general lighting is less than 2 lumens per square foot, auxiliary directional lighting shall be provided on the truck. 1910.178(i) Control of noxious gases and fumes. 1910.178(i)(1) Concentration levels of carbon monoxide gas created by powered industrial truck operations shall not exceed the levels specified in 1910.1000. 1910.178(j) Dockboards (bridge plates). See 1910.30(a). 1910.178(k) Trucks and railroad cars. 1910.178(k)(1) The brakes of highway trucks shall be set and wheel chocks placed under the rear wheels to prevent the trucks from rolling while they are boarded with powered industrial trucks. 1910.178(k)(2) Wheel stops or other recognized positive protection shall be provided to prevent railroad cars from moving during loading or unloading operations. 1910.178(k)(3) Fixed jacks may be necessary to support a semitrailer and prevent upending during the loading or unloading when the trailer is not coupled to a tractor. 1910.178(k)(4) Positive protection shall be provided to prevent railroad cars from being moved while dockboards or bridge plates are in position. 1910.178(l)(1)(i) The employer shall ensure that each powered industrial truck operator is competent to operate a powered industrial truck safely, as demonstrated by the successful completion of the training and evaluation specified in this paragraph (l). 1910.178(l)(1)(ii) Prior to permitting an employee to operate a powered industrial truck (except for training purposes), the employer shall ensure that each operator has successfully completed the training required by this paragraph (l), except as permitted by paragraph (l)(5).1910.178(l)(2)Training program implementation. 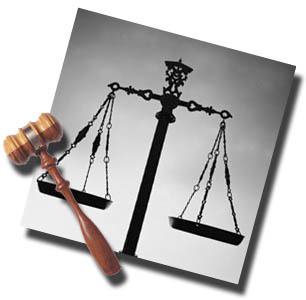 1910.178(l)(2)(i)(B) Where such operation does not endanger the trainee or other employees. 1910.178(l)(2)(ii) Training shall consist of a combination of formal instruction (e.g., lecture, discussion, interactive computer learning, video tape, written material), practical training (demonstrations performed by the trainer and practical exercises performed by the trainee), and evaluation of the operator's performance in the workplace. 1910.178(l)(2)(iii) All operator training and evaluation shall be conducted by persons who have the knowledge, training, and experience to train powered industrial truck operators and evaluate their competence. 1910.178(l)(3) Training program content. Powered industrial truck operators shall receive initial training in the following topics, except in topics which the employer can demonstrate are not applicable to safe operation of the truck in the employer's workplace. 1910.178(l)(3)(i)(B) Differences between the truck and the automobile;1910.178(l)(3)(i)(C)Truck controls and instrumentation: where they are located, what they do, and how they work;1910.178(l)(3)(i)(D)Engine or motor operation;1910.178(l)(3)(i)(E)Steering and maneuvering;1910.178(l)(3)(i)(F)Visibility (including restrictions due to loading);1910.178(l)(3)(i)(G)Fork and attachment adaptation, operation, and use limitations;1910.178(l)(3)(i)(H)Vehicle capacity;1910.178(l)(3)(i)(I)Vehicle stability;1910.178(l)(3)(i)(J)Any vehicle inspection and maintenance that the operator will be required to perform;1910.178(l)(3)(i)(K)Refueling and/or charging and recharging of batteries;1910.178(l)(3)(i)(L)Operating limitations;1910.178(l)(3)(i)(M)Any other operating instructions, warnings, or precautions listed in the operator's manual for the types of vehicle that the employee is being trained to operate.1910.178(l)(3)(ii)Workplace-related topics:1910.178(l)(3)(ii)(A)Surface conditions where the vehicle will be operated;1910.178(l)(3)(ii)(B)Composition of loads to be carried and load stability;1910.178(l)(3)(ii)(C)Load manipulation, stacking, and unstacking;1910.178(l)(3)(ii)(D)Pedestrian traffic in areas where the vehicle will be operated;1910.178(l)(3)(ii)(E)Narrow aisles and other restricted places where the vehicle will be operated;1910.178(l)(3)(ii)(F)Hazardous (classified) locations where the vehicle will be operated;1910.178(l)(3)(ii)(G)Ramps and other sloped surfaces that could affect the vehicle's stability;1910.178(l)(3)(ii)(H)Closed environments and other areas where insufficient ventilation or poor vehicle maintenance could cause a buildup of carbon monoxide or diesel exhaust;1910.178(l)(3)(ii)(I)Other unique or potentially hazardous environmental conditions in the workplace that could affect safe operation.1910.178(l)(3)(iii)The requirements of this section.1910.178(l)(4)Refresher training and evaluation.1910.178(l)(4)(i)Refresher training, including an evaluation of the effectiveness of that training, shall be conducted as required by paragraph (l)(4)(ii) to ensure that the operator has the knowledge and skills needed to operate the powered industrial truck safely.1910.178(l)(4)(ii)Refresher training in relevant topics shall be provided to the operator when:1910.178(l)(4)(ii)(A)The operator has been observed to operate the vehicle in an unsafe manner;1910.178(l)(4)(ii)(B)The operator has been involved in an accident or near-miss incident;1910.178(l)(4)(ii)(C)The operator has received an evaluation that reveals that the operator is not operating the truck safely;1910.178(l)(4)(ii)(D)The operator is assigned to drive a different type of truck; or1910.178(l)(4)(ii)(E)A condition in the workplace changes in a manner that could affect safe operation of the truck.1910.178(l)(4)(iii)An evaluation of each powered industrial truck operator's performance shall be conducted at least once every three years.1910.178(l)(5)Avoidance of duplicative training. 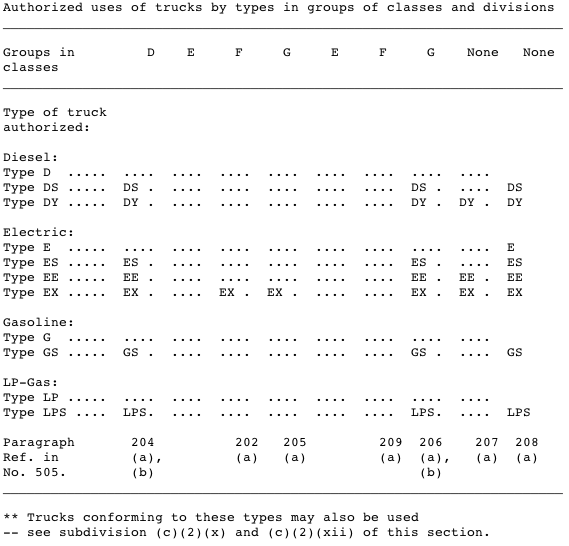 If an operator has previously received training in a topic specified in paragraph (l)(3) of this section, and such training is appropriate to the truck and working conditions encountered, additional training in that topic is not required if the operator has been evaluated and found competent to operate the truck safely.1910.178(l)(6)Certification. The employer shall certify that each operator has been trained and evaluated as required by this paragraph (l). The certification shall include the name of the operator, the date of the training, the date of the evaluation, and the identity of the person(s) performing the training or evaluation.1910.178(l)(7)Dates. The employer shall ensure that operators of powered industrial trucks are trained, as appropriate, by the dates shown in the following table. 1910.178(l)(8) Appendix A to this section provides non-mandatory guidance to assist employers in implementing this paragraph (l). This appendix does not add to, alter, or reduce the requirements of this section.1910.178(m)Truck operations.1910.178(m)(1)Trucks shall not be driven up to anyone standing in front of a bench or other fixed object. 1910.178(m)(2) No person shall be allowed to stand or pass under the elevated portion of any truck, whether loaded or empty.1910.178(m)(3)Unauthorized personnel shall not be permitted to ride on powered industrial trucks. A safe place to ride shall be provided where riding of trucks is authorized.1910.178(m)(4)The employer shall prohibit arms or legs from being placed between the uprights of the mast or outside the running lines of the truck. 1910.178(m)(5)-1910.178(m)(5)(i) When a powered industrial truck is left unattended, load engaging means shall be fully lowered, controls shall be neutralized, power shall be shut off, and brakes set. Wheels shall be blocked if the truck is parked on an incline.1910.178(m)(5)(ii)A powered industrial truck is unattended when the operator is 25 ft. or more away from the vehicle which remains in his view, or whenever the operator leaves the vehicle and it is not in his view. 1910.178(m)(6) A safe distance shall be maintained from the edge of ramps or platforms while on any elevated dock, or platform or freight car. Trucks shall not be used for opening or closing freight doors. 1910.178(m)(7) Brakes shall be set and wheel blocks shall be in place to prevent movement of trucks, trailers, or railroad cars while loading or unloading. Fixed jacks may be necessary to support a semitrailer during loading or unloading when the trailer is not coupled to a tractor. The flooring of trucks, trailers, and railroad cars shall be checked for breaks and weakness before they are driven onto.1910.178(m)(8)There shall be sufficient headroom under overhead installations, lights, pipes, sprinkler system, etc.1910.178(m)(9)An overhead guard shall be used as protection against falling objects. It should be noted that an overhead guard is intended to offer protection from the impact of small packages, boxes, bagged material, etc., representative of the job application, but not to withstand the impact of a falling capacity load.1910.178(m)(10)A load backrest extension shall be used whenever necessary to minimize the possibility of the load or part of it from falling rearward.1910.178(m)(11)Only approved industrial trucks shall be used in hazardous locations.1910.178(m)(12)[Removed and Reserved]1910.178(m)(13)[Reserved]1910.178(m)(14)Fire aisles, access to stairways, and fire equipment shall be kept clear.1910.178(n)Traveling.1910.178(n)(1)All traffic regulations shall be observed, including authorized plant speed limits. A safe distance shall be maintained approximately three truck lengths from the truck ahead, and the truck shall be kept under control at all times.1910.178(n)(2)The right of way shall be yielded to ambulances, fire trucks, or other vehicles in emergency situations.1910.178(n)(3)Other trucks traveling in the same direction at intersections, blind spots, or other dangerous locations shall not be passed.1910.178(n)(4)The driver shall be required to slow down and sound the horn at cross aisles and other locations where vision is obstructed. If the load being carried obstructs forward view, the driver shall be required to travel with the load trailing.1910.178(n)(5)Railroad tracks shall be crossed diagonally wherever possible. Parking closer than 8 feet from the center of railroad tracks is prohibited.1910.178(n)(6)The driver shall be required to look in the direction of, and keep a clear view of the path of travel.1910.178(n)(7)Grades shall be ascended or descended slowly.1910.178(n)(7)(i)When ascending or descending grades in excess of 10 percent, loaded trucks shall be driven with the load upgrade.1910.178(n)(7)(ii)[Reserved]1910.178(n)(7)(iii)On all grades the load and load engaging means shall be tilted back if applicable, and raised only as far as necessary to clear the road surface. 1910.178(n)(8) Under all travel conditions the truck shall be operated at a speed that will permit it to be brought to a stop in a safe manner.1910.178(n)(9)Stunt driving and horseplay shall not be permitted.1910.178(n)(10)The driver shall be required to slow down for wet and slippery floors.1910.178(n)(11)Dockboard or bridgeplates, shall be properly secured before they are driven over. Dockboard or bridgeplates shall be driven over carefully and slowly and their rated capacity never exceeded.1910.178(n)(12)Elevators shall be approached slowly, and then entered squarely after the elevator car is properly leveled. Once on the elevator, the controls shall be neutralized, power shut off, and the brakes set.1910.178(n)(13)Motorized hand trucks must enter elevator or other confined areas with load end forward.1910.178(n)(14)Running over loose objects on the roadway surface shall be avoided. 1910.178(n)(15) While negotiating turns, speed shall be reduced to a safe level by means of turning the hand steering wheel in a smooth, sweeping motion. Except when maneuvering at a very low speed, the hand steering wheel shall be turned at a moderate, even rate.1910.178(o)Loading. 1910.178(o)(1) Only stable or safely arranged loads shall be handled. Caution shall be exercised when handling off-center loads which cannot be centered.1910.178(o)(2)Only loads within the rated capacity of the truck shall be handled.1910.178(o)(3)The long or high (including multiple-tiered) loads which may affect capacity shall be adjusted.1910.178(o)(4)Trucks equipped with attachments shall be operated as partially loaded trucks when not handling a load.1910.178(o)(5)A load engaging means shall be placed under the load as far as possible; the mast shall be carefully tilted backward to stabilize the load.1910.178(o)(6)Extreme care shall be used when tilting the load forward or backward, particularly when high tiering. Tilting forward with load engaging means elevated shall be prohibited except to pick up a load. An elevated load shall not be tilted forward except when the load is in a deposit position over a rack or stack. When stacking or tiering, only enough backward tilt to stabilize the load shall be used. 1910.178(p) Operation of the truck. 1910.178(p)(1) If at any time a powered industrial truck is found to be in need of repair, defective, or in any way unsafe, the truck shall be taken out of service until it has been restored to safe operating condition.1910.178(p)(2)Fuel tanks shall not be filled while the engine is running. Spillage shall be avoided.1910.178(p)(3)Spillage of oil or fuel shall be carefully washed away or completely evaporated and the fuel tank cap replaced before restarting engine.1910.178(p)(4)No truck shall be operated with a leak in the fuel system until the leak has been corrected.1910.178(p)(5)Open flames shall not be used for checking electrolyte level in storage batteries or gasoline level in fuel tanks. 1910.178(q) Maintenance of industrial trucks. 1910.178(q)(1) Any power-operated industrial truck not in safe operating condition shall be removed from service. All repairs shall be made by authorized personnel.1910.178(q)(2)No repairs shall be made in Class I, II, and III locations.1910.178(q)(3)Those repairs to the fuel and ignition systems of industrial trucks which involve fire hazards shall be conducted only in locations designated for such repairs.1910.178(q)(4)Trucks in need of repairs to the electrical system shall have the battery disconnected prior to such repairs. 1910.178(q)(5) All parts of any such industrial truck requiring replacement shall be replaced only by parts equivalent as to safety with those used in the original design. 1910.178(q)(6) Industrial trucks shall not be altered so that the relative positions of the various parts are different from what they were when originally received from the manufacturer, nor shall they be altered either by the addition of extra parts not provided by the manufacturer or by the elimination of any parts, except as provided in paragraph (q)(12) of this section. Additional counterweighting of fork trucks shall not be done unless approved by the truck manufacturer. 1910.178(q)(7) Industrial trucks shall be examined before being placed in service, and shall not be placed in service if the examination shows any condition adversely affecting the safety of the vehicle. Such examination shall be made at least daily. Where industrial trucks are used on a round-the-clock basis, they shall be examined after each shift. Defects when found shall be immediately reported and corrected.1910.178(q)(8)Water mufflers shall be filled daily or as frequently as is necessary to prevent depletion of the supply of water below 75 percent of the filled capacity. Vehicles with mufflers having screens or other parts that may become clogged shall not be operated while such screens or parts are clogged. Any vehicle that emits hazardous sparks or flames from the exhaust system shall immediately be removed from service, and not returned to service until the cause for the emission of such sparks and flames has been eliminated.1910.178(q)(9)When the temperature of any part of any truck is found to be in excess of its normal operating temperature, thus creating a hazardous condition, the vehicle shall be removed from service and not returned to service until the cause for such overheating has been eliminated.1910.178(q)(10)Industrial trucks shall be kept in a clean condition, free of lint, excess oil, and grease. Noncombustible agents should be used for cleaning trucks. Low flash point (below 100 deg. F.) solvents shall not be used. High flash point (at or above 100 deg. F.) solvents may be used. Precautions regarding toxicity, ventilation, and fire hazard shall be consonant with the agent or solvent used.1910.178(q)(11)[Reserved]1910.178(q)(12)Industrial trucks originally approved for the use of gasoline for fuel may be converted to liquefied petroleum gas fuel provided the complete conversion results in a truck which embodies the features specified for LP or LPS designated trucks. Such conversion equipment shall be approved. The description of the component parts of this conversion system and the recommended method of installation on specific trucks are contained in the "Listed by Report."